Engineers Ireland President, Dr Kieran Feighan, ESB Outstanding Contribution to Engineering award recipient, Prof. John Kelly, ESB Chief Executive Pat O’Doherty and Engineers Ireland Director-General Caroline Spillane. 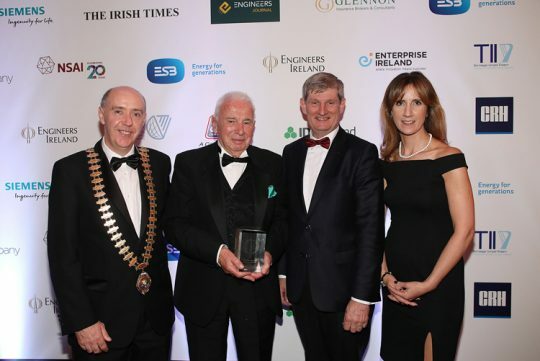 We are delighted to report that ICUF founder & ongoing trustee, Prof John Kelly, was presented with the ESB Outstanding Contribution to Engineering award, presented at the 2017 Engineers Ireland Excellence Awards in Dublin last month. In receving the award, he said ”I am greatly honoured to be given this award, and after some 40 years spent in the academic world concerned mainly with the education of engineers, I recognise that this honour is due not only to me but also to the many colleagues and students in UCD and in the international universities with whom I have had the pleasure to work with throughout my career as a professor of chemical engineering”. The Engineers Ireland Excellence Awards, held in association with the ESB, are presented in recognition of the achievements of engineers who have demonstrated exceptional engineering skills through their work. Now in their eighth year the awards showcase and celebrate the invaluable contribution the engineering profession makes to society.